This system has worked in my classroom for many years, in fact, it's been so successful I've been asked to put in on this site to help other teachers. 1. 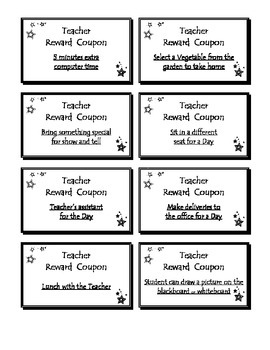 Every day each child receives 5 reward tickets. 2. They may receive more tickets or lose some depending on their behavior, attitude, late work etc. 3. 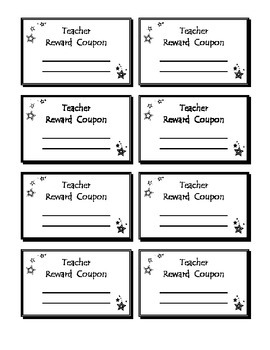 These tickets are like money to the children, they've even given them away to each other on their birthdays in class. 4. 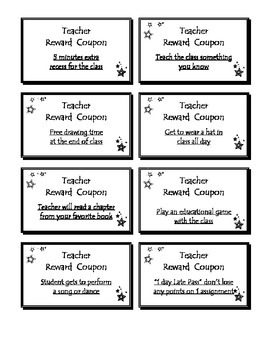 I also print the coupons and as a class we decide how many tickets each coupon is worth.Some tickets are 30 some are 120 depending on which ticket it is and what the reward is, the main thing is it's your class, you make the rules but make sure the children know how many tickets each coupon takes. You are not responsible for lost tickets. They may turn their coupons in whenever they want too. Happy Rewarding! The reward tickets are sold on another one of my pages because the file was too large too download. Thank you.